Mr. George T. Arataini, a long time supporter of the Institute of Buddhist Studies was conferred an Honorary Doctorate at his home in Hollywood, CA on Thursday, June 17, 2010 by Rev. Dr. David Matsumoto, the IBS George and Sakaye Aratani Professor. 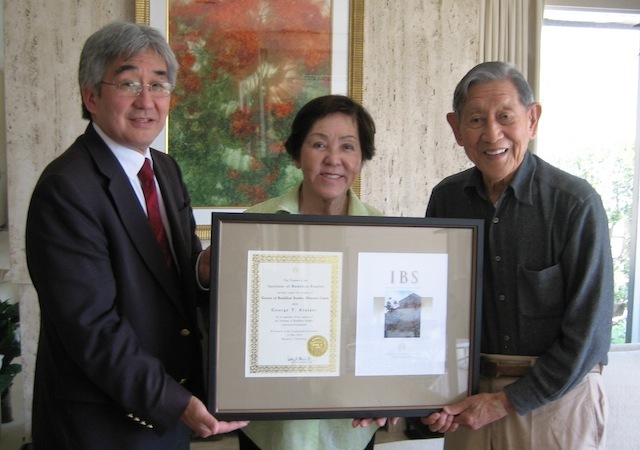 Dr. Aratani was not able to attend the IBS Commencement Ceremony held on May 14, 2010 in Berkeley, CA. In making the presentation Dr. Matsumoto expressed the heartfelt appreciation of the IBS Board of Trustees for his generous support and encouragement for the success of the IBS in its future growth and development. Present at the home ceremony were Mrs. Aratani, Rev. Hiroshi Abiko, Rinban of the Los Angeles Buddhist Temple Betsuin, and Rev. Dr. Seigen Yamaoka.